WFT-CX: We drive in all weathers! 6-component Wheel Force Transducers (WFT) are used in research and development to determine the forces and torques at the wheels during test drives. The new WFT-CX is not only waterproof but also provides a significantly higher resistance against any mechanical or thermal load in all weather conditions. Based on an innovative digital signal conditioning electronic and a completely new mechanical design a new level of measurement accuracy can be reached which was not possible in the past. Due to the innovative concept of a widely digitized signal processing the new WFT-CX requires substantially fewer strain gauges than comparable systems. The traditional noise sensitive analogue treatment of strain gauge signals is now replaced by digital online computing. This results in a much higher dynamic of the measuring signals, which allows for so called comfort measurements as well as measurements on impassable grounds. The signal processing in total is designed to guarantee an utmost accuracy in data logging widely free of noise and disruptions. This could be achieved by extremely short wiring, an optimized placement of the strain gauges and through digitization very close to the test points. The fully differential input circuits of the amplifiers associated with the bridge supplies provide for the highest possible noise reduction. Additionally 16 thermal sensors properly distributed inside the WFTs allow for an optimum temperature compensation. Together with the high incremental angle resolution of 0.072 degree per revolution, this guarantees for the best possible accuracy. 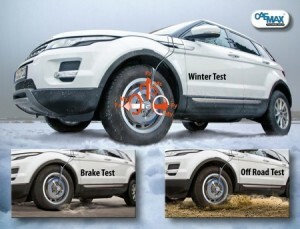 The application of the new WFT-CX ranges from small cars (minimum rim diameter: 14 inches) up to big limousines, but particularly covers also SUVs and light trucks (maximum diameter of the hub: 5,5 inches). Apart from the waterproof design the shock resistance up to 50g (g being the gravity acceleration) is essential, which for the first time allows for experiments with drives over heavy bumps (“speed bumps”). The overall design of the WFTs being optimized in view of heat conduction and cooling avoids an extensive heat development even in case of full breakings. Just one example: After 20 full braking runs from a speed of 150 km/h, the temperature of the WFT even in this case did not exceed 50°C. The design of the whole signal processing covers a temperature range from -40°C to +105°C. Compared to the past, all these points lead to an enormously widened scope of possible applications which now include break, comfort and tire tests with just one WFT configuration.